Brains!!!! 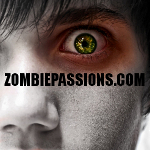 I have always loved Zombies in film, literature, history and as a favorite Halloween costume. I love all of the classic Zombie films as well as some of the not so classic ones. WhenI was in college, I was a makeup assistant and played a zombie in Tom Savini's 1991 remake of Night of the living dead.